Are you considering getting a reptilian pet? If so, a crested gecko may be a great choice for you! These gentle, lovely lizards are a wonderful choice for first-time reptile owners. Here, a local Moorpark, CA vet discusses crested gecko care. Baby geckos can live comfortably in a plastic terrarium or a 10-gallon reptile tank. Once your little buddy is fully grown, he’ll need a larger home, such as a 20-gallon tank. Keep in mind that larger tanks are not only better for pets, they also make for more attractive displays. Choose a tank with a screen top. You’ll need to add a suitable substrate, such as reptile carpet. You can also use coconut fiber mixed with soil, or a peat/moss soil mix without perlite. Add some climbing branches, cork bark segments, and live or artificial plants. Crested geckos do have specific temperature and humidity needs. Your pet’s cage should be around 78 – 80°F during the day, and the low 70’s at night. Leave one end of the tank unheated, so your scaled pal can cool off if he gets hot. Your tiny dinosaur won’t need special lighting. However, crested geckos do require a tank humidity of at least 50%, so you’ll need a good humidifier. Ask your vet for more information. Crested geckos can eat a powdered diet, supplemented with fruit and live insects, such as crickets. As with any other pet, your reptilian friend will also need fresh water. Ask your vet for specific nutritional advice. 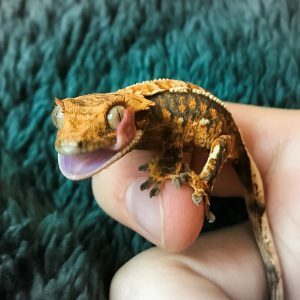 Do you have questions or concerns about crested gecko care? Please contact us, your Moorpark, CA pet hospital, anytime!